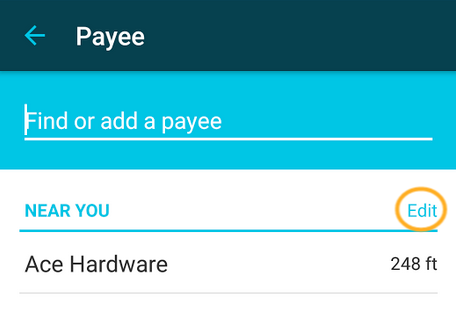 The Geo Payees feature saves the location you're in when you enter a transaction on a mobile device. That way, the next time you're in that location, YNAB saves you time by filling in the payee – as well as the category and account you chose last time. - Scroll down and tap on Privacy. - Select Location Services (at the very top). - Make sure Location Services is toggled on/green. - Then, scroll down to "YNAB" in the list and choose While Using the App. Go to Settings > Location to turn on the Location feature. To enable location usage for the YNAB app, go to Settings > Apps > YNAB > Permissions and toggle Location on. 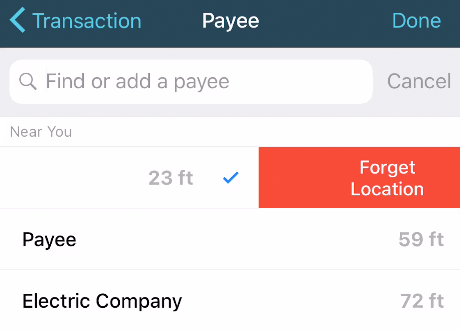 When Geo Payees is enabled, each time you enter a transaction using the mobile app, you can choose whether or not to save the location of that payee. Let’s say you’re at home, and you don’t want to save the location – tap the "x" in the blue globe icon. 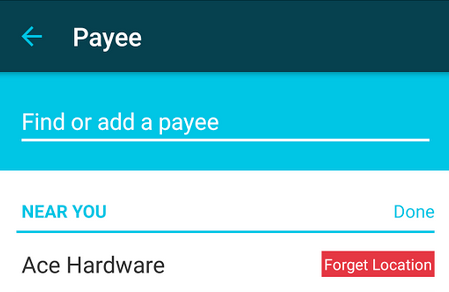 If a payee ever pops up and it's associated with the wrong location, tap on it to open your payee list. At the top you'll see a "Near You" section where you can choose to "Forget Location" for that payee. In the Near You section, swipe left on a payee and then tap Forget Location. In the Near You section, tap Edit and then Forget Location. - Then, scroll down to "YNAB" in the list and change it to Never. - Navigate to your Settings Menu and select Apps. - Toggle the Location setting off.